MORE FASHIONABLE AND CONFORTABL – 3.0 Generation of smartphone virtual reality headset, 3D VR Glasses will bring you a brand new experience for relaxing with a much lighter weight of only 251 grams, which emancipates your neck from heavy boxes as before. Adjustable Lens and Strap make you feel more comfortable. Three adjustable straps can distract the pressure from the bridge of nose. Are you looking for a pair of VR headset? But troubling which to choose? The VR SHINECON 3.0 Version of Virtual reality glasses box would be your best choice. 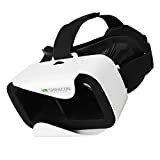 3.0 Generation of smartphone virtual reality headset, 3D VR Glasses will bring you a brand new experience for relaxing with a much lighter weight of only 251 grams, which emancipates your neck from heavy boxes as before. Adjustable Lens and Strap make you feel more comfortable. Three adjustable straps can distract the pressure from the bridge of nose. Take this VR Headset in your bag outside to anywhere, or in your car,bedroom,living room,cafe to enjoy movies and play games.Enjoyment will not be limited to a cinema. Take the glassed with your smartphone, take the whole world with you. Improved new material used to better fix the smartphone without worry for falling nor scratching the phone’s screen. Easily put smart phone in the glass box, and pull the smartphone out. Suitable for the nearsighted people with myopia under 600 degree. Besides, you can choose to wear your spectacles for myopia with the VR glasses at the same time to ensure a best viewing experience. Fits for any smartphone with size from 4.7 to 6.0 inches, and systems of Android, Win and IOS.